Whomever is actively dieting and counting calories for a prolonged period of time, may have been teased by friends of having OCD. Is counting calories obsessive behaviour? For an obese person, it is is easier to simply cut calories by cutting entire food groups such as wheat, foregoing desserts, eat from smaller plates or fast intermittently. For someone at a normal weight trying to get very lean it makes perfect sense to count calories as this requires far more precision. It is a different matter when he becomes a hermit and refuses to go to parties or brings his own perfectly planned food without having a dangerous allergy or a weigh-in the next week for a boxing competition with weight classes. This would trespass the line of logical habits and routines and go into the territory of illogical obsessive behaviour. A common trait for someone with OCD is ungrounded fear something dreadful happens when they don't act on their compulsions: gaining weight when they even forget to weigh and count the calories of an apple. People with OCD seem to have other things in common: a circadian rhythm longer than 24 hrs, resulting in an inability to go to bed at an appropriate hour. They also have poor navigation skills, including bumping into objects at home. 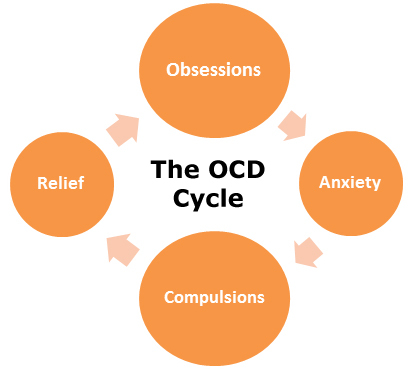 Disorders that are closely related to OCD are among others, depression, anxiety, anorexia, as well as compulsive nail-biting. The most effective treatment for OCD is behavioural therapy in which someone is gradually exposed to things that trigger compulsive behaviour, e.g. starting at not counting smaller low-calorie snacks they consume when away from home. Often,behavioural therapy is combined with SSRI-like supplements such as SAM-e, inositol, 5-HTP or CBD. Inositol, also known as vitamin B8, is needed for cel-to-cell communication, including the transmission of nerve impulses. Apart from providing the building blocks for nerve impulse transmission , it can also be converted to energy sources such as glucose and glucoronic acid.